We are staying in an apartment on our trip to Tel Aviv, on a street named after Yohanan HaSandler. Three questions pop up in my head – Who was he to receive such an honor? Who really cares? And why write about this? After all, if you would like to know this for whatever reason, just ask Siri or Alexa, and voilà, you’ll get an answer. As another Jew whose name is Yeshua (also known as Jesus), who lived about an hour car drive from the current borders of Tel Aviv, and who lived about two thousand years ago, suggested, “Ask and it will be given to you” (Matthew 7:7). Turns out, that the name Yohanan HaSandler belonged to an important figure in the Jewish world, who lived from 100 CE to 150 CE (close to the time when the Gospel of Matthew was written). He was one of the main students of Rabbi Akiva. My next question was why to name the street after someone who lived in the area, which is now called Israel, so many years ago? To answer my own question, I decided to read about the history of Tel Aviv online. But before that, I needed to establish a connection between this new city and the ancient world. In the Jewish Bible, it is written that a Jewish monarchy began in 10th century BCE. The first appearance of the name “Israel” in the secular historic record is in the Egyptian source circa 1200 BCE. Over thousands of years, the Jewish people were expelled by different conquerors, only to stubbornly return to claim what they rightfully believed was their land. You can read about this fascinating “History of the Jews and Judaism in the Land of Israel” in Wikipedia. During the 19thcentury, the area was under the control of Ottoman Syria, and after World War I – under the British Mandate. About 10,000 Jews living in the area were called Palestinian Jews, who resided primarily in Safed, Hebron and Jerusalem. Things changed in the late nineteenth century. Inspired by the Zionist movement, the large-scale immigration of Jews to Palestine began in 1882 and continued in 1903, where a large numbers of Jews were escaping pogroms. Their destination was the ancient port of Jaffa. Since it was predominantly populated by Muslims and had limited space, in 1909 a group of about 60 Jewish families decided to create the first all-Jewish city in modern times. In 1910, it was named Tel Aviv, which means “hill of spring”. It was built on the sand dunes bordering the Mediterranean Sea and was known as “White City”. 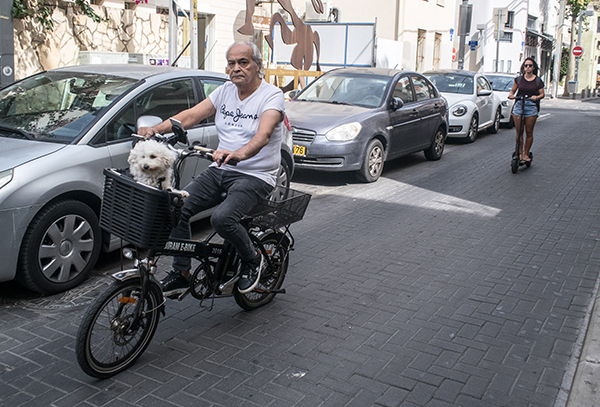 I suspect that the name of the street after a Jewish teacher who lived 1900 years earlier is the proof that in spite of all historical separations, the real connection with the core of Jewish teaching was never broken. 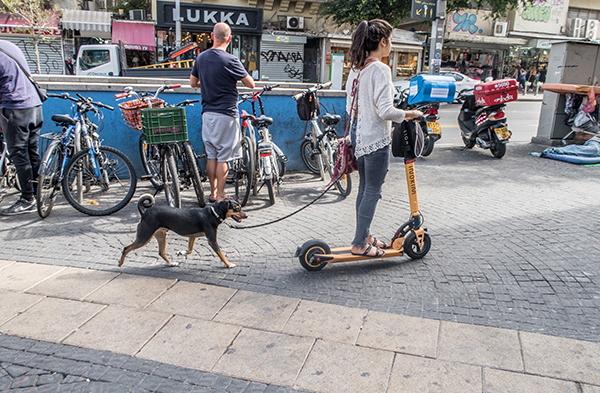 Today, Tel Aviv, which merged with Jaffa in 1950, has a population of about four million; it is a vibrant city, considered to be the “party capital” in the Middle East with 24-hours a day of culture. P.S. 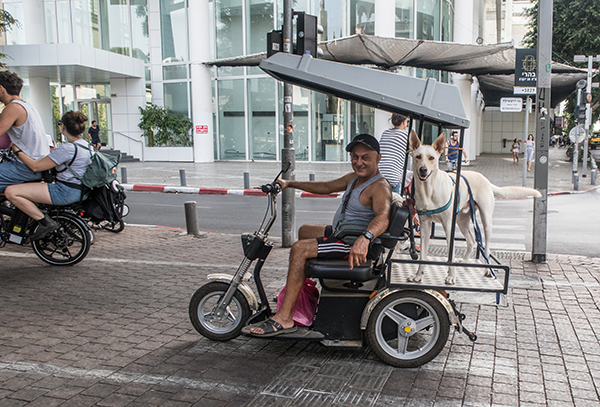 During our trip to Tel Aviv we encountered many dog lovers, as you can see in these four images. If you are a dog lover, you do not have to travel far away, just buy “42 Encounters with Dog Lovers” on Amazon and Encounters Publishing.